Cons: During his freshman and sophomore seasons, his nickname was “Lazy Leggett” as he took practices and plays off quite regularly. He is still learning as a blocker, so he can be very inconsistent with his pad level and effort. Leggett engages the defender he needs to block for a second or two and doesn’t keep his legs churning. The young tight end moves on, which causes well blocked plays to only have a very short window of success. The former Tiger has some concentration issues, dropping very catch-able passes or letting the pigskin slip into his body instead of catching it cleanly with his hands. This tendency to run hot and cold affects how much a quarterback can trust him. In two of Clemson’s biggest games this year, Leggett had zero grabs versus Auburn and then one catch for four yards against Ohio State in the semi-final championship game. Pros: The senior play maker can line up in the backfield, slot, out wide, or as an H-Back. He can block well, when motivated, but rarely sustains. As a receiver, Leggett gets off the line using his hands and feet well. The tight end shields the ball well from defenders and comes down with plenty of 50/50 contested passes. His routes are fairly crisp, shows good concentration, and has soft hands to cradle the pigskin. The former Tiger does a great job finding a soft spot in the zone and seems to enjoy catching passes in the middle of the field, occasionally showing of a double move or two. Leggett snares the ball in stride and can contort his body to make the difficult catches. The tight end has a good catch radius: fully extending to make the high grabs and digs down low for those worm burners. He can make the bucket catch over his shoulder or take a short screen into the end zone and is a huge red zone threat. 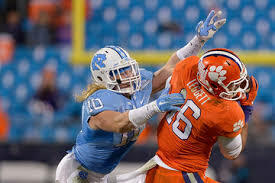 Overall impressions: I’m not convinced that Leggett can be a two-way tight end, due to his reluctance to block, but with the right tight end coach, it may be possible. His fantasy contributions will be more similar to the way Jordan Reed is used versus Jason Witten. In a deep class of tight ends, I have Leggett as my sixth ranked tight end. That could put him in the third or early fourth round of your rookie drafts and well worth the value there. Thanks for reading. I will continue to discuss my scouting reports with you throughout the next few weeks before the draft, so keep checking the site for more content. Please check out my other content as well. You can also follow me on Twitter @AndrewMiley. « WR-Malachi Dupre-Big play threat and more?